Jóhann Jóhannsson evokes the sound of space and time falling in love together... in the '60s. Directed by James Marsh, written by Anthony McCarten and based upon a memoir by Jane Hawking, The Theory of Everything is a film about how physics superstar Stephen Hawking met his first wife while studying at Cambridge back in the 1960s. The soundtrack of a love story with an academic backdrop comes with a few expectations. First of all, this is Cambridge we're talking about. Isaac Newton studied there, so it's got to be collegiate. But the main narrative is two people falling in love, so it shouldn't be too stiff sounding. You can't have two young English kids making goo-goo eyes at each other over Scarlatti. And of course, it can't be too flowery. One of the two main characters gets diagnosed with ALS and is told he won't live more than two more years. I won't say there this is only one right person for the job, but the score for The Theory of Everything makes a good case for Icelandic composer Jóhann Jóhannsson as a highly stylized mood setter. No stranger to soundtracks himself, Jóhannsson doesn't not work within exclusively acoustic or electronic formats with music. Electronic keyboards are mixed with wind instruments. An orchestra in Abbey Road will play alongside an electric harpsichord. Other times, just a piano will do. All told, it's a very thorough mix. Casual listens won't make clear what is real horse hair and what is synthesized. Even close listens won't always make it clear. Jóhannsson doesn't bend genres, he blends them. And as far as film soundtracks go, that's a smidgen above par-for-the-course. Blending genres doesn't mean that he gets to reinvent the wheel. The score for The Theory of Everything has many rolling cycles and a few returning themes. Repetition is not a pejorative word in this context, it's simply a necessity. The piano ostinato of "Forces of Attraction" is a figure striking enough to grab your attention outside of the film. Its gentle performance, easy-to-take chord cycle and soft string arrangement make it a heart-wrencher. And with a cue named "Rowing", you can bet your spectacles that you will hear many a repeated phrase. A film soundtrack that moves ahead faster than the narrative risks puzzling the audience, as I'm sure Jóhannsson is aware. Even when a whole orchestra inside Abbey Road studios under the direction of Anthony Weeden or Ben Foster at your disposal, the most they can do for a romantic scene is provide a heavy yet soft vamp. One standout is "Collapsing Inwards". I do not know in what part of the film this cue appears, but it must be a pause pregnant with profundity because it ends very abruptly. Other tracks on the album, for better or worse don't live up to their titles. "The Voice Box" is fifty-two seconds of a descending two-note figure played on what sounds like a music box, surrounded by lush strings. "The Wedding" doesn't give away any impression that a big milestone is happening in someone's life. It might as well be named "The Picnic". But Jóhann Jóhannsson wasn't hired to get our attention; he was hired to enhance a movie. 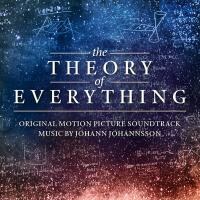 The Theory of Everything the soundtrack album may or may not find life outside of the film’s release, but Jóhannsson doesn't have to count on that. At the rate he works, he's probably moved on to the next thing already.